Biodata in Acrobat PDF format here. 1949 - Born in Pune, Maharashtra, India. 1972 - Graduated in Medicine from the Armed Forces Medical College, Pune. Worked as a Radiologist at Thane, near Mumbai, from 1975 to 2005. Lives and works in Thane. 2005-06 - A two person exhibition with Gieve Patel. Museum Gallery, Mumbai; Bose Pacia, New York. 2002 - Sakshi Gallery, Mumbai; Jehangir Art Gallery, Mumbai. 2001 - Sakshi Gallery, Bangalore. 2000 - A two person exhibition with Ajay Desai. Gallery 7, Mumbai. 1995 - Chemould Gallery, Calcutta. 1994 - Gallery Chemould and Jehangir Art Gallery, Mumbai. 1992 - Jehangir Art Gallery, Mumbai. 1990 - Art Heritage, Delhi. 1989 - Jehangir Art Gallery, Mumbai. 1984 - Jehangir Art Gallery, Mumbai. 1979 - Jehangir Art Gallery, Mumbai. 1979 - Art Heritage, Delhi. - ‘Faces of Indian Art’, Art Alive Gallery at India Habitat Centre, New Delhi. - Inaugral show, Sakshi Gallery, Mumbai. - ‘Art on the Wing’ Sarjan Art Gallery, Vadodara. - ‘1st Anniversary Exhibition’ Galerie Mirchandani+Steinruecke, Mumbai. - ‘Greenscape’ BNHS Auction, Mumbai. - ‘Art Fusion Show’ Nehru Center, Mumbai. - ‘Gateway Bombay’, Peabody Essex Museum, Salem, Mass, USA. - ‘Yuva Parivartan’, Tao Art Gallery, Mumbai. - -‘Faces of Indian Art’, Art Alive Gallery at India Habitat Centre, New Delhi. 2006 - ‘Shadow Lines’ Vadehra Art Gallery, New Delhi. - ‘Art for Conservation’ Mall Galleries, London, UK. - ‘A work of Art, a work on paper’ Cymroza Art Gallery, Mumbai. - ‘Indian Art – Inventing / Inverting Traditions’ Grosvenor Vadehra, London, UK. - ‘Modern Indian works on Paper’ Jane Voorhees Zimmerli Art Museum, New Jersey, USA. - ‘Art for Concern’ Hasenda Art Gallery, Mumbai, Bangalore. 2005 - ‘Bhupen Among Friends’ Gallery Chemould, Mumbai. - ‘Ardhanarishvara’ Tao Gallery, Mumbai. - Bicentenary Celebrations Auction, Asiatic Society, Mumbai. - ‘New Paradigma II’ Gallery Treshold, New Delhi. - ‘Grey’ Gandhara Art Gallery, Kolkata. - ‘Still-Life’ Gallery Art Motif, New Delhi. - ‘Joie de Vivre’ Art Konsult, New Delhi. Perth, AUSTRALIA; Asia Society, New York, USA. - ‘Selected works from the Jehangir Nicholson Collection, Mumbai. - ‘Visions of Landscape’ Guild Art Gallery, Mumbai. - ‘The World of Serigraphs’ Sarjan Art Gallery, Vadodara. 2003 - ‘Said & Unsaid’, Apparao Galleries, Jehangir Art Gallery, Mumbai. - exhibition organised by Gandhara Art Gallery at India Habitat Center, New Delhi. - ‘Men Against Violence and Abuse’, Artists Center, Mumbai. - ‘Works on Paper’, Gallery Threshold, India Habitat Center, New Delhi. - ‘Tiranga’, Jindal Foundation for Performing and Creative Arts, India Habitat Center, New Delhi. - Exhibition organised by Parkinsons Disease Foundation of India, Mumbai. - diVERGE, Forty year of Gallery Chemould, NGMA, Mumbai. The State University of New Jersey, U.S.A.
- ‘Icons and Symbols in Indian Art, CIMA, Calcutta. Paul Robeson Gallery, Rutgers, The State University of New Jersey, U.S.A.
2001 - Century City, Tate Modern, London, UK. -10th Anniversary Show, Sakshi Gallery, Bangalore. - Osian’s ‘The Passionate Detachment’ auction, Mumbai. - ‘Figures in My Mind’ Gallery Espace, New Delhi. - ‘In Conversation’ Gallery Espace, New Delhi. - ‘Ideas and Images’ NGMA, Mumbai. - ‘The Human Factor’ The Guild, Jehangir Art Gallery, Mumbai. - ‘Extreme Gourmet’ Indigo, Lakeeren, Mumbai. - Chitram Art Gallery, Cochin. - The Harmony Show, Nehru Center, Mumbai. - Millennium Show, Nehru Center, Mumbai. - ‘Human Figure’ Gallery 42, New Delhi. 1999 - Group Exhibition (Vadehra Art Gallery), Jehangir Art Gallery, Mumbai. - Icons of the Millennium ( Lakeeren Art Gallery ) , Mumbai . - ‘The world is round and time is cyclical ‘ – Art Today , New Delhi . - Elephanta Project , INTACH , Mumbai. - ‘The Art of Charity’ Sir J J Parsee Benevolent Inst. J J School of Art Mumbai. - Christie’s ‘Twentieth Century Indian Art’ auction, London, UK. 1998 - ‘Artists for Sustainable Development’ Gallery Chemould, Mumbai. - Indian Contemporary Art, (Vadehra Art Gallery), Jehangir Art Gallery, Mumbai. - Anniversary Exhibition , ( Chitram Art Gallery ) , Cochin . - Christie’s Contemporary Indian Art Auction, London, UK. - ‘The Intuitive Logic’ II Exhibition and Auction, Mumbai. - ‘Charcoal & Conte’ Birla Century Art Gallery, Mumbai. 1996 - ‘A Tree in My Life’ The Village Art Gallery, Delhi. auction by Sotheby’s, New York, USA. - Exhibition felicitating Dnyaneshwar Nadkarni, Jehangir Art Gallery, Mumbai. Academy of Art and Culture, Calcutta. - ‘Contemporary Indian Painters 96’ Jehangir Art Gallery, Mumbai. - ‘Save the Children’ Exhibition and auction by Sotheby’s, Mumbai. - Art for CRY Jehangir Art Gallery, Mumbai & Lalit Kala Akademi , Delhi. - ‘Mumbai’ RPG, Jehangir Art Gallery, Mumbai. - ‘Art India Now’ Bose Pacia Modern, New York, USA. 1994 - Drawing 94 Gallery Espace, Delhi. 1993 - ‘Parallel Perceptions’, Sakshi Gallery, Mumbai. - ‘Shraddha Samarpan’, Jehangir Art Gallery, Mumbai. - ‘Trends and Images’ CIMA, Calcutta. 1992 - ‘Journeys within Landscapes’ Sakshi Gallery , Jehangir Art Gallery, Mumbai. - Silver Jubilee exhibition, Birla Academy of Art & Culture, Calcutta. 1990 - ‘Gadyaparva Exhibition’ Gallery Chemould, Mumbai. - An Artistic Riot - Sophia Art Gallery, Mumbai. 1989 - ‘The Richness of Spirit’ Egyptian Academy, ROME. - ‘Timeless Art’ exhibition and auction by Sotheby’s, Mumbai. - ‘Artists Alert’ exhibition for Safdar Hashmi Memorial Trust, Delhi. 1988 - Art for CRY Mumbai, Calcutta, Delhi, Bangalore. - ‘The Richness of Spirit’ KUWAIT National Museum. 1987 - ‘Coupe de Coeur’ Geneva, Switzerland. 1986 - Group exhibition organized by Altaf, New Habib High School, Mumbai. - Festival of India, Georges Pompidou Centre, Paris, France. - ‘Contemporary Indian Art’, Festival of India, New York, USA. 1984 - Ten Artists, Gallery 7, Mumbai. 1982 - Inaugural Exhibition, Roopankar, Bharat Bhavan, Bhopal. - ‘Aspects of Modern India Art’, Oxford, UK. - ‘Contemporary Indian Art’, Festival of India, London, UK. 1981 - ‘Place for People’ Jehangir Art Gallery, Mumbai; Ravindra Bhavan, Delhi. 1979 - Madhya Pradesh Kala Parishad , Bhopal. 1976 – Bombay Art Society, Jehangir Art Gallery, Mumbai. National Gallery of Modern Art, Mumbai and Delhi. Jehangir Nicholson Museum, NCPA, Mumbai. Gallery of Contemporary Art, Kochi. Heart, Neville Tuli Foundation, Mumbai. Peabody Essex Museum, Salem, Mass. USA. and other private collections in India and abroad. ‘The Complicit Observer’ The Art of Sudhir Patwardhan, by Ranjit Hoskote. Published by Eminence Designs and Sakshi Gallery. 2004. 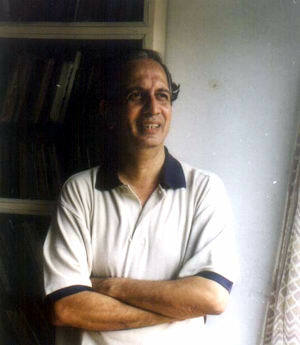 ‘Chitrakar Sudhir Patwardhan’ (in Marathi) by Padmakar Kulkarni. Published by Lok Vangamaya Griha, 2005 Mumbai. ‘Saacha’ a film about a poet – Narayan Surve, a painter – Sudhir Patwardhan, and a city – Mumbai. Directors : Anjali Monteiro and K P Jayasankar.